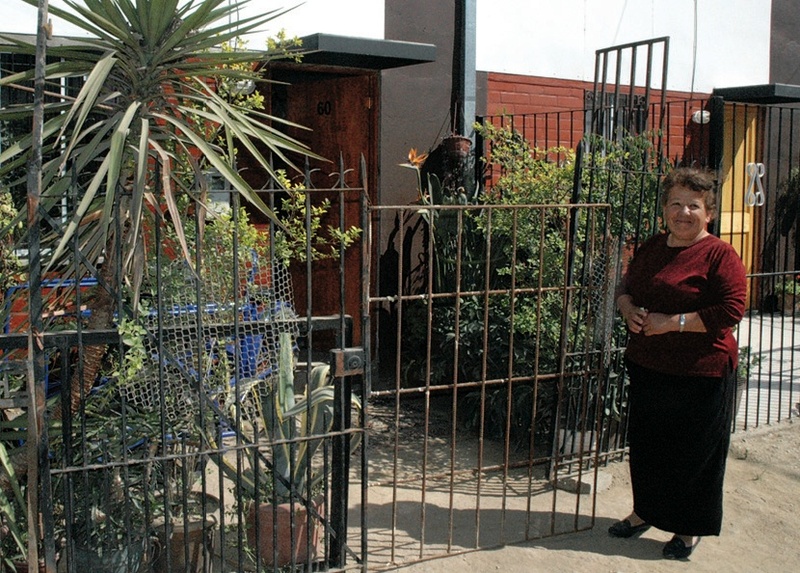 ...she has fenced in her front yard and filled it with plants, which she sells as her livelihood. 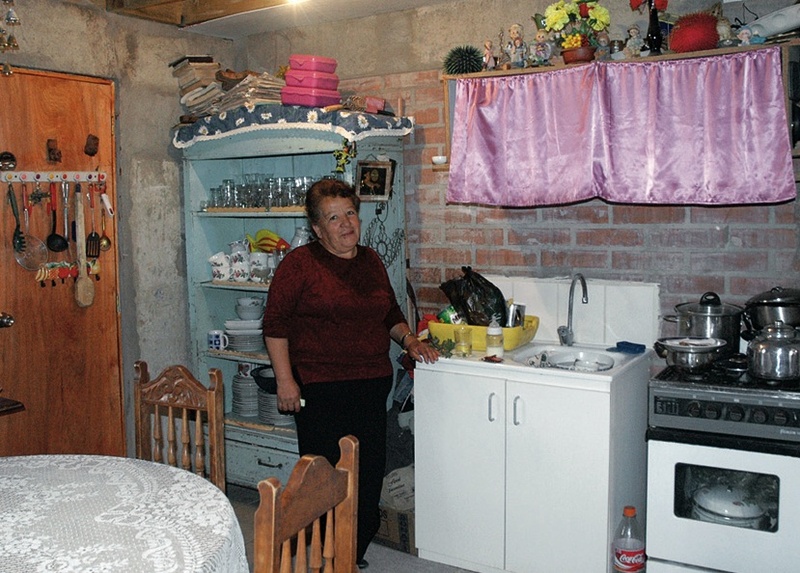 And Ortega says this home, though unfinished, is a big improvement over her former makeshift home in the shantytown. A courtyard at the Renca development, with a tree planted by residents and surrounded by rocks that the residents also painted. They are building the park themselves, a symbol of pride in their new home. 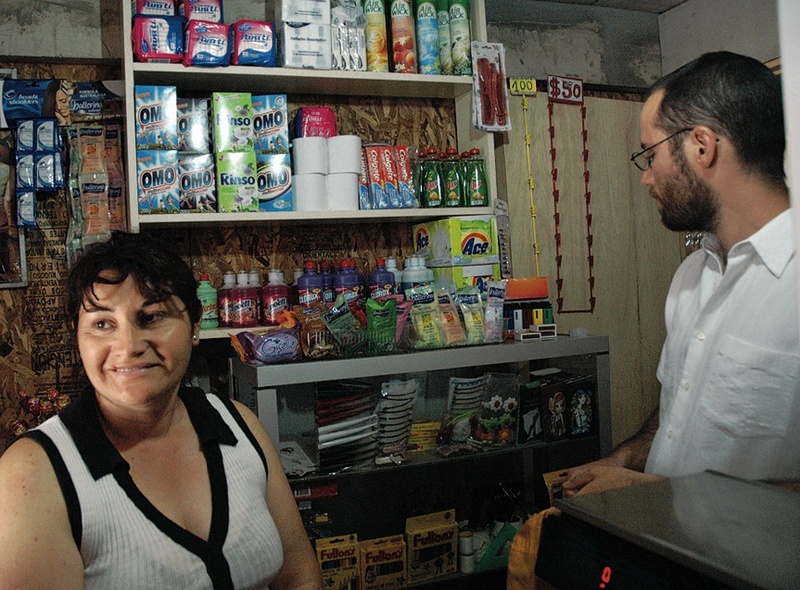 Marta Herrera, pictured with ELEMENTAL project manager Gonzalo Arteaga, has set up a small convenience store in the front room of her house at the Lo Espejo development. View additional photos and descriptions of ELEMENTAL. Santiago, Chile—A young boy plays unsupervised in front of a house that bears a small wooden sign, handwritten in marker: Se venden helados (ice cream for sale). The development has transformed residents’ lives—and is transforming notions about housing the poor. Similar developments are built or under way at other locations in Chile; there are plans to replicate the project in other countries. 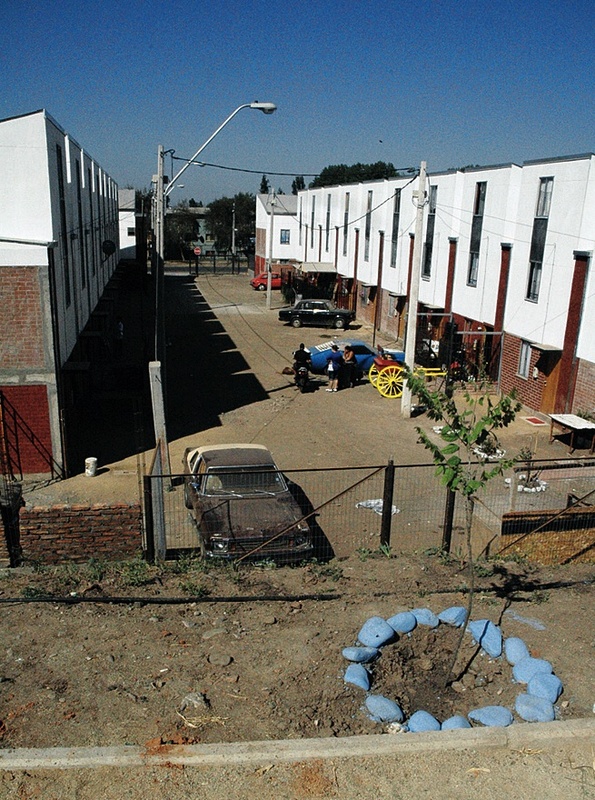 All this sprang from an international competition to design very low-cost housing for Santiago’s poor, organized in 2003 with conceptual and financial support from the Graduate School of Design (GSD) and the Santiago office of Harvard’s David Rockefeller Center for Latin American Studies. ELEMENTAL, the architecture firm formed around the goal of building a handful of the winning designs, has taken on a life of its own and branched out far beyond this initial vision, but Chileans with Harvard connections remain influential. The firm’s principals include director Andrés Iacobelli, M.P.A. 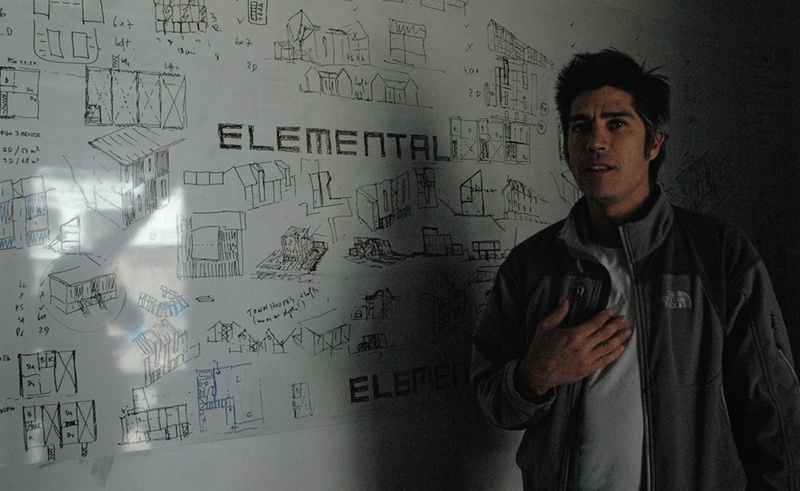 ’01, and executive director Alejandro Aravena, a professor of architecture at Pontifical Universidad Católica de Chile who was a visiting professor at the GSD from 2000 to 2005. Support from Pablo Allard, M.A.U. ’99, D.Dn. ’01, director of Católica’s undergraduate program in cities, landscape, and environmental studies, has also been instrumental. The red-and-white row houses are located in the Renca district, less than half an hour by car from downtown Santiago. The high housing density of ELEMENTAL’s projects allows for purchasing land close to the city center (one development fits 93 units onto 1.2 acres). As a result, residents don’t need to move to an outlying site an hour-long commute (or more) away from jobs. They remain in the same neighborhood, with the same neighbors. They don’t have to find a different bus route to work, or enroll their children in different schools. The government gives a subsidy of $10,000 for each housing unit, an amount that must cover the cost of the land, building materials, and construction. Working within that limited ceiling, the architects construct much larger homes than that amount of money would normally buy, but leave the interiors unfinished. The houses have working plumbing, heating, and lighting, but bare concrete floors and plasterboard walls: ELEMENTAL provides the skeleton, but leaves the finishing touches to residents. Aravena is fond of saying each unit has “the DNA of a middle-class home.” And, notes one resident, it is a vast improvement over her previous residence, with makeshift walls and a muddy dirt floor. At the dedication ceremony for the Renca development in May, one of the residents gave a speech. For the first time in her life, she said, she felt proud to be Chilean. One of ELEMENTAL’s goals for the project was that the units increase rather than decrease in value over time. They didn’t have to wait long to measure their success: the very day that residents were allowed to move in, some received offers of $20,000—double each unit’s cost. Associate editor Elizabeth Gudrais traveled to Chile in October to report on projects involving Harvard faculty and alumni. View further reports from her trip.